This dial thermometer has a unique dial face with specific temperature notations that guide the brewer through the brewing process. Its hermetically sealed glass face ensures long life. The large dial has a "fine-point" pointer and crisp large lettering. An easy to read thermometer. 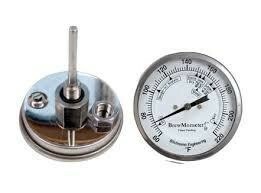 This themometer fits most 1/2" female couplers. 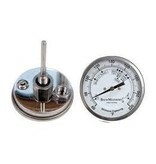 The threaded can also be used with the thermometer bulkhead. Choose the option from the drop down menu below. You will need to have a 7/8" hole in you kettle. Measurable temperature range: 60-220 F (No Celsius scale).